DETROIT, Mich.-They say you can’t build a program overnight. Well, women’s track & field at Marygrove is doing their best to rewrite the old adage as they enter the first season in program history. 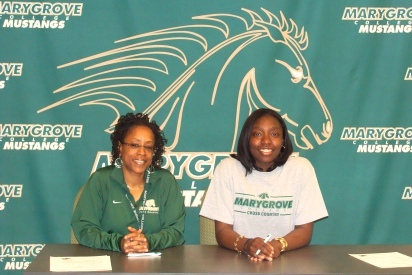 The Mustangs took another step forward by signing Lydia Taylor as their second commit in as many weeks. Taylor is a 5’6″ multi-event runner out of Southfield High School. Her individual events were the 100, 200 and 300 meter sprints. Also a relay participant, Taylor excelled a member of the 4×100, 4×200, and 4×400 meter squads. Working within a team was Taylor’s strong suit as she earned multiple medals and trophies for the 4×100, 4×200, and 4×300 events over the past two years. She culminated a long list of awards with All-State Certificates in the 4×100 and 4×200 in 2009. The quintessential student-athlete also fueled excellent classroom engagement as a honor roll member several times at Southfield High. Coach Womack on Taylor: Lydia is an excellent young lady with a truly remarkable success story. She certainly has the skill set and heart to become very successful at the collegiate level. She shows great commitment to both her sport and studies on a daily basis.